Politician, Lieutenant-Governor of Manitoba (1882-1888). Born in the County of York, Ontario, on 30 March 1823, the son of James Aikins. He received his early education in Upper Canada and graduated in 1843 from Victoria College and University, Cobourg. In 1845 he married Mary Elizabeth Jane Somerset. They had eight children. 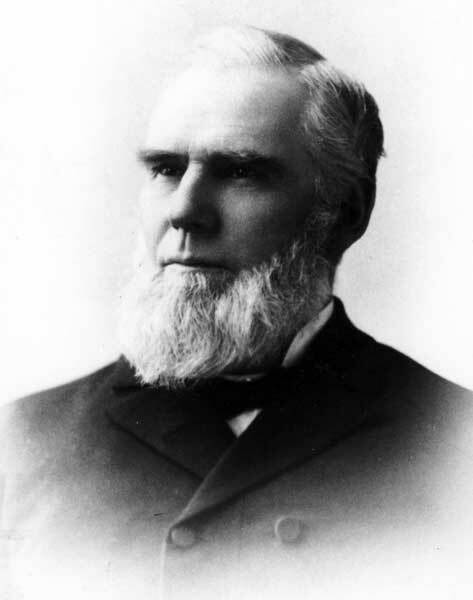 He represented the County of Peel in the Legislative Assembly of Canada from 1854 to 1861. In 1862 he was elected member of the Legislative Council and continued until 1867. Following Confederation he occupied a seat inthe Senate, until December 1869 when he became Secretary of State, in whichoffice he served until 1873. In 1878 when the Macdonald Government was returned to power he again became Secretary of State. In 1880 he was madeMinister of Inland Revenue but resigned in March 1882, and on 22 September 1882, he was appointed Lieutenant-Governor of Manitoba. He served for five years and seven months (1888), and it was during his term the boundaries of the Province were enlarged. In 1896 he was reappointed to the Senate. He was a Methodist, and took an active part in the founding of Wesley College (now the University of Winnipeg). Aikins died on 6 August 1904. He left three sons and four daughters, two of his sons, J. A. M. Aikins and Somerset Aikins, being prominent citizens of Winnipeg. His correspondence (1882-1893) and other papers are held at the Archives of Manitoba. He is commemorated by Aikins Street in Winnipeg.